Stephen Harper shamelessly encouraging asbestos exports to kill Indians! NATIONAL and international organizations that study the causes and prevention of disease epidemics this week called for a global ban on the mining, use, and export of all forms of asbestos. Their statement has already been endorsed by over 150 public health, civil society organizations and individual scientists from 20 countries. “Continued use of asbestos will lead to a public health disaster of asbestos-related illness and premature death for decades to come, repeating the epidemic we are witnessing today in industrialised countries that used asbestos in the past,” said Dr. Stanley Weiss, Chair of the Joint Policy Committee of the Societies of Epidemiology (JPC-SE), which released the statement this week. The JPC-SE comprises a number of Canadian, U.S. and international epidemiology organizations. The statement notes that the asbestos industry has used tactics of intimidation to try to silence scientists. It urges public health organizations to support the right of scientists and academics to carry out their work in the public interest free from intimidation. Desperate Quebec Premier Jean Charest Is Going To Kill More Indians With Cancer-Causing Asbestos: What The Hell Are Cowardly South Asian MP’s Doing About It? Deadly Asbestos: Contractor Jailed For 60 Days, But What About Prime Minister Harper And Greedy Businessmen? Harper, Stop Killing Indians With Asbestos! Mr. Harper, Why Are You Killing People In India And Other Countries Around The World With Asbestos? … And Back To Killer Asbestos! You can read more on this issue at www.AsianJournal.ca by typing in “asbestos” in the Google search box on the website. This is with reference to news report ‘Thailand’s move to ban asbestos leaves Quebec looking foolish’ (National Post, Christopher Nardi, July 26, 2012), we wish to express our deep sense of appreciation for initiating efforts to ban chrysotile asbestos (white asbestos) imports in the coming months. We have noted that in January 2011, Thailand’s National Economic and Social Advisory Council recommended banning imports and sales of asbestos in Thailand due to its link to health problems, including cancer. We welcome the resolution adopted in February 2011 by Thai authorities to ban it. It is indeed quite significant that the resolution was proposed by the National Health Commission of Thailand, chaired by you. We have observed how your government has debunked misplaced claims about safe and controlled use of asbestos like more than 55 countries. There is no sanity in adopting Ostrich policy in eth face of the resolution passed by World Health Organization, International Labour Organisation World Federation of Public Health Associations, the International Commission on Occupational Health and even the World Bank Group seeking elimination for future use of asbestos of all kinds including chrysotile to prevent preventable diseases and deaths of innocent workers, consumers and citizens from the killer fibers of asbestos. We congratulate you for joining the anti-asbestos movement which is critical of countries like Canada and Russia who “export cancer”. Your government’s initiative reveals the immorality of Quebec government’s investment in Jeffrey asbestos Mine. We wish to inform you that your action set an example for Government of India to follow which is also “considering the ban on use of chrysotile asbestos in India to protect workers and the general population against primary and secondary exposure," a concept paper of September 2011 by the Indian Ministry of Labour. Besides even Indian Environment & Forests Ministry s Vision Statement on Environment and Human Health recommends, "Alternatives to asbestos may be used to the extent possible and use of asbestos may be phased out" and the Ministry of Chemicals has disassociate India from countries like Russia and Canada who derailed the international consensus thatcould have categorised chrysotile asbestos as a hazardous substance. We wish to state that you are on the right path. In India, the Union Budget 2011-12 made an implied critical reference to asbestos by including it under Health Ministry s National Health Insurance Plan (Rashtriya Swasthya Birna Yojana) to cover the 'unorganised sector workers in hazardous mining and associated industries like asbestos etc. In light of the above, your sensitivity towards public health and action to address the environmental and occupational health crisis due to asbestos based hazardous industries is praiseworthy and worthy of emulation by ASEAN countries and Asian countries like India. Environmental and public health groups eagerly await the formal announcement of ban on the carcinogenic fibers. You have demonstrated that your government holds public interest rather than corporate interest dear to its heart. CBC News , July 24, 2012: Canadian and International organizations released a statement Tuesday, calling for a global ban on the mining and exporting of asbestos. "There is no controversy, we know it causes disease and death," Weiss told CBC News. "We are still dealing with the devastating impact of past use and we want to stop a continuing epidemic." A call for the global ban on all forms of asbestos was made today by more than 150 international organizations. The statement, released Tuesday, calling for the ban on the mining, use and export of all form of asbestos has already been approved by over 150 public health organizations and scientists from at least 20 countries. The statement was released on the heels of last month's announcement by the Quebec government saying it would lend $58 million to help re-start the former Johns-Manville mine in Quebec, keeping the production and export of asbestos going for another 20 years. "Continued use of asbestos will lead to a public health disaster of asbestos-related illness and premature death for decades to come, repeating the epidemic we are witnessing today in industrialized countries that used asbestos in the past," said Dr. Stanley Weiss, chair of the Joint Policy Committee of the Societies of Epidemiology, which released the statement. The group includes a number of Canadian, U.S. and international epidemiology organizations, working together for the first time to fight the distribution of asbestos. "The body of evidence is now so overwhelming and it was time to step up and come together as a group," Professor Colin Soskolne, past-president of the Canadian Society of Epidemiology and Biostatistics, told CBC News. While activists argue asbestos is linked to cancer, industry proponents have insisted it can be used safely if handled properly. "The vast majority of people who are not in the pocket of industry …we all agree that the time has come to expose the controversy as a non-controversy." Soskolne said. "There is no doubt about the harmful effects of asbestos, and there is not enough doubt to undermine the need for policy change." Those opposed to asbestos are urging major producers — including Brazil, Kazakhstan, Russia and Canada — to put an end to mining and exports and help communities make the transition to a different industry. "Promoting deceit is immoral and we need to take a higher ground than the one we are taking … and help the people in those mining communities to retool and develop different industries," he said. In the 1960s and '70s a number of asbestos miners began showing signs of respiratory diseases and as a direct result Canada began to rid homes, schools and offices of the hazardous material applied as insulation. However, Canada still mines and exports white asbestos — which is a form the Canadian government says is safe to use. "There is a profound double standard that can't be defended on any moral basis," Soskolne said. "Giving this substance to developing countries is utterly immoral." The epidemiologists say they hope their efforts highlight the seriousness of the health hazards. The International Commission on Occupational Health (ICOH) is an international non-governmental professional society whose aims are to foster the scientific progress, knowledge and development of occupational health and safety in all its aspects. It was founded in 1906 in Milan as the Permanent Commission on Occupational Health. Today, ICOH is the world's leading international scientific society in the field of occupational health with a membership of 2,000 professionals from 93 countries. The ICOH is recognised by the United Nations as a non-governmental organisation (NGO) and has close working relationships with ILO, WHO, UNEP and ISSA. After a large consultation, large discussion, several comments among ICOH working groups, members of the ICOH Board and NGOs’ representatives, the ICOH President, Dr. Kazutaka Kogi, approved the ICOH Statement on Global Asbestos Ban and the Elimination of Asbestos-related Diseases. We strongly thank all those who have given their contribution dedicating their time and work on it. We hope this ICOH statement represent an important tool towards the global asbestos ban and the elimination of all asbestos-related diseases. The International Commission on Occupational Health (ICOH) calls for a global ban on the mining, sale and use of all forms of asbestos and the elimination of asbestos-related diseases. To accomplish the elimination of asbestos-related diseases, we urge each and every individual country to implement a total ban on production and use of asbestos. We also urge complementary efforts aimed at primary, secondary and tertiary prevention of asbestos-related diseases through country-specific “National Programmes for Elimination of Asbestos-Related Diseases” in line with ILO and WHO guidelines. International consensus has recommended that a total ban on production and use of all forms of asbestos is the best way to eliminate the occurrence of asbestos-related diseases. In 2006 WHO stated that the most efficient way to eliminate asbestos-related diseases is to stop using all types of asbestos.3) The ILO Resolution on Asbestos, 2006, calls for eliminating the use of asbestos and identifying and properly managing asbestos currently in place as the most effective means to protect workers from asbestos and to prevent future asbestos-related diseases and deaths.4) By government decision, a number of countries have already adopted a universal ban on all types of asbestos based on recognition of the substantial human and economic burden of diseases caused by asbestos. Some other countries have banned the use of amphibole asbestos, predominantly crocidolite, but have not banned the use of chrysotile. As there is sufficient evidence by the International Agency on Research on Cancer (IARC 2012) that chrysotile causes malignancies of the lung, pleura and peritoneum, amphibole-only bans are inadequate; asbestos bans need to include chrysotile as well. Some countries have banned the production and/or use of asbestos-containing industrial products, but have continued to mine, sell and export asbestos. This is an unacceptable policy and should be reconsidered by those countries. In order to be effective, a total ban on production, use and export of all forms of asbestos should be achieved in every country. Even after a total ban on production and use of asbestos is achieved, occupational exposures to asbestos will persist due to the continued presence of asbestos from prior use in building materials and durable machinery/equipment. Workers who carry out maintenance, demolition and removal of asbestos-containing materials will thus continue to be at risk. Therefore a set of protective measures must be implemented to optimize effective prevention. The adoption of a total ban on all use of asbestos and products, equipment and materials containing asbestos implies a need to follow up the implementation of the ban with supplementary regulations and national programmes for ensuring the elimination of all use of asbestos and the required protection from exposure to asbestos. This includes, as appropriate, the review of legislation and regulatory systems regarding trade and the protection of consumers and external environment. Primary prevention involves ensuring control of exposures to airborne asbestos fibres, monitoring concentrations according to established standards and reporting exposure levels to appropriate authorities. There is no exposure level below which asbestos-related disease risk can be totally eliminated. To minimize asbestos exposure, reference exposure limits (i.e., threshold limit values or occupational exposure limits) should adhere to international norms. Complying with these limits will reduce, but not totally eliminate, the risk of asbestos-related diseases. Exposed workers should be informed about their working conditions and associated hazards, and provided with appropriate respirators. While respirators should not be relied upon as the sole means of routinely limiting exposure to asbestos fibres, workers provided with them should be trained for their proper use, and encouraged to wear them when warranted. Adequate fitting, changing of filters, sanitary storage and maintenance of respirators are also required for optimal protection. Licensing or authorization procedures need to be considered to ensure safe handling, repair, maintenance and demolishing operations. Ambient air levels at the boundary of demolition sites adjacent to residential areas should be strictly monitored and kept below exposure limits. Proper and safe handling of asbestos-contaminated waste is essential. Finally, in view of the synergistic effect of smoking and asbestos exposure on lung cancer risk, smoking cessation programmes are essential for all workers currently and previously exposed to asbestos. Tertiary prevention includes medical intervention and public health services to limit disease-related disability and help workers affected by asbestos-related diseases to cope with chronic effects of their disease. Appropriate medical care and rehabilitation for the diseases and their potential complications, including immunization against pulmonary infections, should be provided. After disability and impairment evaluation, just compensation and disability benefits should also be provided, as warranted. Individuals with asbestos-related diseases should be reported to authorities and public health registries. Public health surveillance of asbestos-related diseases, in particular malignant mesothelioma, asbestosis and pleural abnormalities, can help track progress towards eliminating asbestos-related diseases and may identify where further primary prevention efforts are needed. Public health surveillance of reported exposure levels can also be used to target enhanced primary prevention. Achieving a worldwide ban on the mining, sale and use of all forms of asbestos and the elimination of asbestos-related diseases will require that physicians and occupational health personnel responsibly and persistently express their concerns, raise awareness and take necessary action regarding the need to prevent asbestos-related diseases. Recognizing the urgent need for coordinated actions, ICOH will continue to foster global and national collaboration in this endeavour, promoting the engagement of ICOH members in training occupational medicine and health professionals in competencies needed to support comprehensive national efforts to eliminate asbestos-related diseases. 2) American Thoracic Society Documents. Diagnosis and Initial Management of Nonmalignant Diseases Related to Asbestos. Am J Respir Crit Care Med 2004; 170: 691–715. SO a desperate Quebec Premier, Jean Charest, has now approved a $58-million loan to Canada’s last asbestos mine – a mine that “can only survive with artificial government life support,” as activist Kathleen Ruff put it – so that Canada can once again START KILLING poor people in INDIA and other developing countries with this CANCER-CAUSING material! And what the hell are our South Asian Conservative Party MPs - minister of state Bal Gosal (Bramalea-Gore Malton), minister of state Tim Uppal (Edmonton-Sherwood Park), parliamentary secretary Deepak Obhrai (Calgary East), Devinder Shory (Calgary Northeast), Parm Gill (Brampton-Springdale), and Nina Grewal (Fleetwood-Port Kells) – doing about this? The COWARDS are too scared to speak out because of DICTATORIAL Prime Minister Stephen Harper who has been supporting the asbestos exports just to WIN VOTES! Yes, even while we continue to spend millions of dollars in the removal of this cancer-causing material from buildings in Canada, our UTTERLY SHAMELESS Prime Minister Stephen Harper has been supporting asbestos export from the province of Quebec just to win votes. As I have repeatedly said, my blood sure BOILS at Canadian blatant criminality and sheer hypocrisy in the suffering and death of thousands of POOR INDIANS and others around the world, thanks to Canadian asbestos – all for profits. What moral standing can Canada have in the world with its ASBESTOS TERRORISM? Canadian actress Heidi Von Palleske, who watched both her parents die from asbestos-related illnesses, said her mother is “turning over in her grave.” She said it was a shame that the fight against asbestos has to continue. Indeed, even as WHITE Canadians have boldly condemned the suffering and death asbestos is causing in India and other countries, our BROWN MPs are messing up their pants before Harper. They should OPENLY condemn this MASS MURDER. THE Asian Journal has been attacking asbestos exports for the past two years after CBC TV’s Melissa Fung investigative feature titled “Canada’s Ugly Secret” - first aired in June of 2009 - exposed how Canadian diplomats actively promote the asbestos business. Ironically, Harper’s own former cabinet minister Chuck Strahl has incurable lung cancer because of asbestos! And last year about 250 doctors and public-health professionals urged Conservative MP Kellie Leitch, a prominent pediatric orthopedic surgeon, to honour her medical oath and oppose the asbestos industry. Dr. Leitch was an associate professor of surgery at the University of Toronto. And then it added: “You can find asbestos inspection and removal companies in the Yellow Pages under Asbestos Removal, Health and Safety Consultants, or Environmental Consultants. “WorkSafeBC also has information about asbestos, including a diagram of where it could be found in your home, in Punjabi on our website. Go to www.WorkSafeBC.com, select the Punjabi link at the top of the page and look for Asbestos Hazards in Demolition, Renovation, and Salvage. Keeping people of Indian origin in Canada safe – but exporting asbestos to India TO KILL OUR FELLOW INDIANS! KOZHIKODE: For the children of many schools in the district, the asbestos roofs over their head are posing a serious health hazard. Oblivious to the fact that the asbestos is carcinogenic (cancer-causing), they continue to attend classes. Though the State Human Rights Commission prohibited the use of asbestos as roofs in state schools in January 2009, nearly 60 schools, both private and government-run, in the district are yet to implement the order. Though no cases of any asbestos-related diseases have been reported from these schools so far, the surprising fact is that the district education officials don't even have a proper account of the number of schools using asbestos as roofs. "We do not have a consolidated data on this. Of the 1,162 schools in the government, aided and unaided sectors, less than 100 schools are functioning in temporary buildings made of asbestos roofs," said P Ajayakumar, deputy director of education in-charge. Though the official claimed that the number is more in schools run by private managements, he quickly added that steps are being taken to ensure that government schools do not use asbestos. "We are in the process of ensuring that buildings of government schools that are functioning in the temporary sheds do not use asbestos," he said. But the schools which use asbestos have their own reasons to defend the use of this carcinogenic material for roofs. Many say that lack of funds compel them use asbestos for roofing as it is cheaply available. "We know the health hazards of asbestos sheets. But we are helpless. We don't have money to construct school building by spending huge sums. There were 15 classrooms under asbestos roofs. We have reduced the number to nine," said N Basheer, staff secretary of the Government Ganapath Model Girls HSS. He said the school would use Rs 1 crore granted by the state government to build nine new classrooms. But many education department officials also blame the state government for the tardy progress in checking the use of asbestos in schools. "Though the government issued a circular, no follow-up action was taken to check if the order is being implemented," said an assistant education officer who declined to be named. Meanwhile, doctors in the district forewarn that continuous exposure to asbestos also known as the deadly white fibre increases the risk of lung cancer. "Prolonged exposure can create scratches in the lung. It can also cause incurable mesothelioma cancer," said Dr E Narayanan Kutty Varrier, an oncologist. He said that children also face the risk of asbestosis, a condition in which the breathing ability of lungs is affected. Considering the serious health threats to schoolchildren, the district panchayat is planning a special project as part of this financial year to remove asbestos sheets from government schools. "We have found 12 government higher secondary schools that use asbestos roofs. An initial discussion on this has already taken place with the deputy director of education," said K P Sheeba, district panchayat chairperson of health and education standing committee. New Delhi 13/7/2012: ToxicsWatch Alliance (TWA) and Ban Asbestos India campaign welcome the cancellation of the No Objection Certificate (NOC) given to the Visakha Asbestos Industries in Parmanpur, Sambalpur, Odisha has been cancelled by the District Magistrate, Sambalpur. The NOC which was provided earlier by the previous Sarpanch has been found illegal. The Padmanav Nath, new Sarpanch has cancelled it. The DM has approved this cancellation. The picture of the plant site is enclosed. 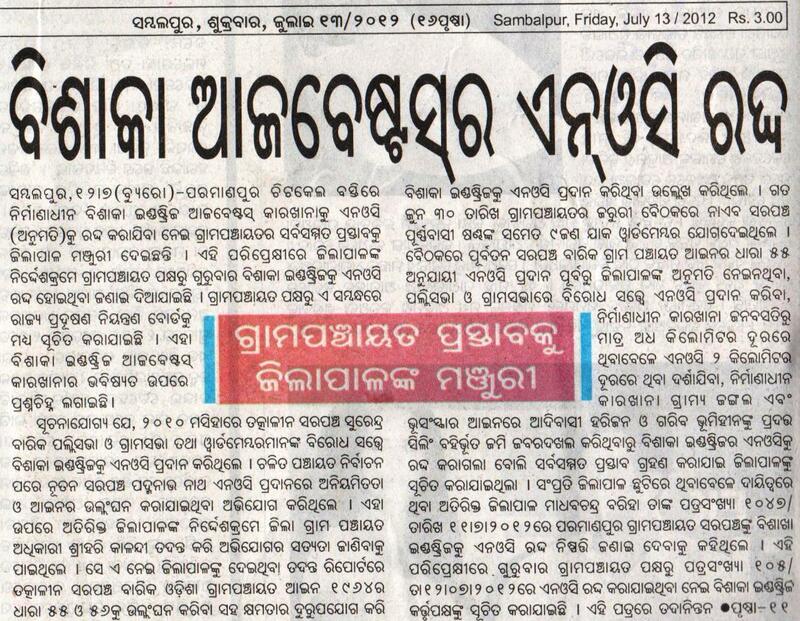 The news clippings from Sambalpur attached. TWA has learnt that despite the cancellation of the NOC, the plant is still running. Authorities must act to ensure that the plant's illegal operations are stopped. The panchayat committee had not approved the commissioning of the plant at the place. The former Sarpanch Surendra Barik had given approval without the knowledge and consent of peoples’ representatives in violation of the Odisha Gram Panchayat Act. On a petition with the District Panchayat Officer filed by newly elected Sarpanch, the officer thoroughly inquired the matter and declared the NOC to be illegal in his report. The company got consent to operate after the previous NOC. It has applied for renewal of license with the Odisha State Pollution Control Board for extension of its capacity to 2, 50, 000 MT. 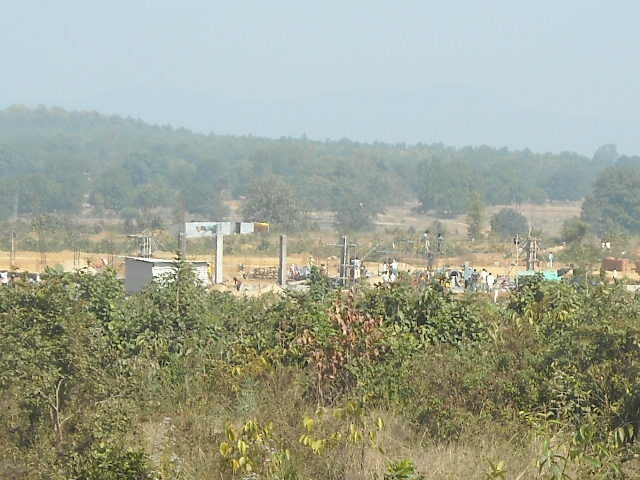 The asbestos cement factory in Parmanpur has been facing massive and unprecedented opposition by the villagers. 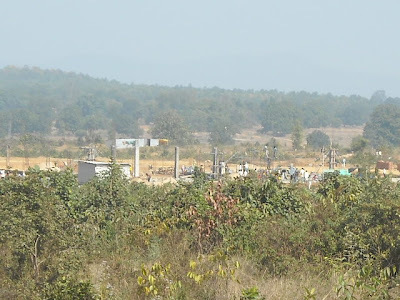 The Visaka Asbestos Industries’ proposed plant to manufacture 216,000 tons per annum of Asbestos Cement Sheets at Mouza: Paramanpur, Taluq: Maneswar, Dist:Sambalpur is fraught with disastrous consequences for the villagers of Odisha. TWA had written to Odisha State Human Rights Commission after Parmanpur Gram Surakshya Samiti informed it about the hazardous plant. 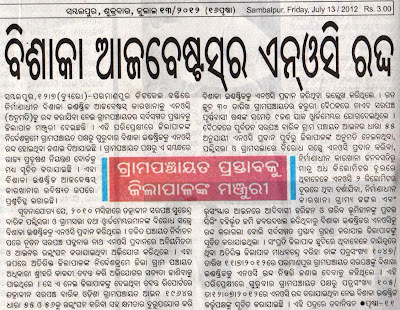 Villagers of Nuagan, Kendupali, Lebidi Mauza and several other villages are also resisting the the proposed hazardous asbestos cement roofing factory at Naagaon-Lebidi villages, Sohella Block, Bargarh district of Odisha under the banner of Paribesh Suraksha Parishad (JPSP). The company M/s Viswakarma Roofings Ltd. intends to establish 150,000 Tonnes Per Annum of Asbestos Cement Sheets Manufacturing Project at Bargarh. Prior to TWA had written to the President and Governor, when Odisha Governor’s Helicopter had collided with the asbestos shade at the Bhubneshwar airport when he was travelling with Hon’ble President Mrs Pratibha Devi Singh Patil on December 9, 2009. Clearly, asbestos danger is lurking in every corner in Odisha. There was inquiry ordered into this collision by Indian Air Force, Union Ministry of Defense. TWA wants to know as to when will the inquiry report in President’s helicopter collision with asbestos roof in Bhubneshwar be made public. In a letter to the President dated January 3, 2010, it was pointed out that “Our armed forces are at a grave risk of asbestos exposure because asbestos has been used extensively in their work places and residential places. In the Army and Air Force, asbestos is used in brake and clutch pads installed in everything from tanks to jeeps to aircraft. Asbestos is part of the insulation in housing and other buildings on military bases, electric wiring insulation aboard military planes, and fire retardant materials used by military firefighters and gunners. In the Navy, Merchant Marine, and Coast Guard, it is even more widely used, mainly as thermal insulation aboard ships. Asbestos is used in old and new constructed naval vessels. TWA demands immediate moratorium on new asbestos based plants, a plan to decontaminate the pre-existing asbestos from public and private buildings and a compensation fund for the victims of asbestos related diseases. New Delhi, July 10, 2012: In a letter to Jean Charest, Premier, Government of Quebec, Canada and Stephen Harper, Prime Minister, Government of Canada, ToxicsWatch Alliance (TWA) has expressed its sense of outrage and dismay at the announcement of a $58 million loan for revival of the Jeffrey Asbestos mine under the influence of Chrysotile Institute, a white asbestos industry funded group. Canadian High Commission has confirmed that the letter dated July 6, 2012 has been sent to their offices. In a separate letter to Prime Minister of Government of United Kingdom his urgent intervention has been sought to stop banks, financial institutions and companies from investing in the Indian white asbestos industry. TWA has pointed out that companies like Jagjiwan Enchem Udyog Limited Company are admittedly “associated with world’s leading 150 years old reputed company M/s. Scandura Ltd., the British Belting Asbestos group of companies. Mr. Dilip J. Pandya founder promoter of the company had undergone intensive asbestos process training at M/s. Scandura Ltd., in England.” The company reveals that its Aqua Dispersion Process technology imported from BRITISH BELTING & ASBESTOS GROUP of U.K. 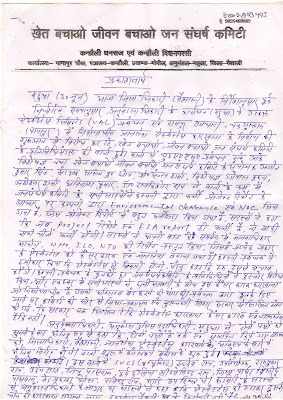 The letter dated July 10, 2012 is attached. Such involvement of British business interests in asbestos companies is unacceptable. This also reveals a manifest case of double standard given the fact that use of asbestos is banned in UK. It is noteworthy that TWA and Ban Asbestos India campaign has purposefully persuaded several ministries of Government of India and other agencies to discourage and phase out white asbestos trade but India remains one of the key consumers of asbestos from Quebec, Russia and other countries. Years of efforts by citizen groups are beginning to yield results. • Union Ministry of Labour has revealed that that the “Government of India is considering the ban on use of chrysotile asbestos in India to protect the workers and the general population against primary and secondary exposure to Chrysotile form of Asbestos." • Union Ministry of Chemicals took the right step on June 21, 2011 when it disassociated India from Canada and other asbestos producing countries in order to get white asbestos listed in the UN list of hazardous materials. • Union Ministry of Mines has technically banned asbestos mining in India. • Union Ministry of Railways is working to make all railway platforms in India asbestos free. • Union Ministry of Environment & Forests has announced that asbestos may be phased out. • Union Ministry of Finance has announced that asbestos related diseases will be covered under Rashtriya Swasthya Bima Yojana but this is hardly sufficient in the absence of environmental and occupational infrastructure. • National Human Rights Commission has issued notices to all the State Governments, Union Territories and concerned ministries of central government to file the status of asbestos disease victims and asked them why it should not be banned. The Commission has underlined that keeping inmates under asbestos roof is harmful and alternative roofs should be used. • Kerala State Human Rights Commission (KSHRC) has made recommendations seeking banning use of asbestos roofs in its order dated January 31, 2009. • Delhi Government has banned use of asbestos roofs for new schools. • Villagers’ protest in Muzaffarpur and Vaishali in Bihar has led to closure of asbestos factories. The construction of lung cancer causing white asbestos plants in Madhubani, West Champaran and production in Bhojpur districts is also facing resistance. • Villagers are protesting against the proposed hazardous asbestos cement roofing factories in Sambalpur and Bargarh district of Odisha. • Protests against asbestos factories States like Himachal Pradesh and Andhra Pradesh is going on. • Fact finding teams visited to asbestos plant in Maksi, Madhya Pradesh and asbestos factories in Jujjuru village, Veerulapadu Mandal, Krishna district, Hyderabad Industries Ltd, IDA in Kondapalli, Ramco Industries Ltd in Ibrahimpatnam and proposed factory site of Sahyadri Industries Ltd in Narasimharaopalem in Andhra Pradesh. During the visits in July and August 2011, the team interacted with workers and victims. It emerged that there is no official documentation of their plight. It is quite evident that the epidemic of asbestos related diseases that has led to bankruptcy of asbestos companies as a result of their liabilities cannot be ignored. This unscientific decision of the Liberal Party-led Quebec government that was announced on June 29, 2012 by ignoring the views of World Health Organisation (WHO), International Labour Organisation (ILO), National Public Health Institute, Canadian Medical Association and Canadian Cancer Society. TWA has urged the Quebec government and Canadian government to reconsider its decision and cancel the loan guarantee and help the asbestos disease affected communities in the developing countries. This decision of the Quebec government gives the impression that in Canada ether asbestos industry and the government are one entity or government is subservient to the lust for blind profit at human cost. In its letter to UK Prime Minister, TWA has pointed out that in the U.S., Dow Chemicals Company has set aside $2.2 billion to address future asbestos-related liabilities arising out of the Union Carbide acquisition. Dow Chemical Company that purchased Union Carbide Corporation (UCC) and its Indian investments in 1999 has consistently denied inheriting any liability for the Bhopal gas disaster due to leakage of 40 tonnes of lethal methyl isocyanate (MIC) gas from UCC plant into the surrounding environment, which has caused more than 20,000 deaths and 100,000 disabilities. UCC formerly made products containing asbestos, and UCC once mined asbestos for sale to customers. The mine of the UCC was sold in 1985. If Dow Chemicals can accept the asbestos liability of UCC, how can it argue that it does not have any liability of Bhopal Gas Leak Disaster? It has asked him to reconsider the association of London 2012 Olympics with questionable corporations like Dow Chemicals, BP and Rio Tinto to enhance UK’s stature as a civilized nation. The $58 million Quebec government assistance being given to develop a new asbestos mine in Quebec is outrageous. It will lead to public health disaster in countries like India where asbestos related diseases from past exposure is yet to be documented. This will add to the disease burden.